My neighbour gave birth to a beautiful baby boy last Monday, and he’s simply adorable! It’s so nice to have a newborn bubba only next door!!! My favourite jumbo wheel, Nursery Letters, is the base for this card. Then I used God’s Blessing for the sentiment, which fits perfectly inside the large square metal edge tag! I was happy about that! Do you recognise a new colour? It’s the new In Color, Pacific Point, and it’s gorgeous!! I even sponged around the edge of the sentiment to use more of the ink!! LOL! The other colour is Bashful Blue … and the ribbon is the Bashful Blue 1″ double stitched. This is a close up of the stars … aren’t they sparkly!!! I punched out the stars and using my Versamark ink and the Heat & Stick powder, I then adhered Chunky Sprinkles to the stars. It has been a while since I’ve had the time for a Kristina Werner Colour Challenge … and I didn’t have time today either, but I had to make time because I simply adore these colours … and the image!! It was my husband’s birthday on St Patrick’s Day … remember the card I made for him, here? Anyway, these are the cards Isabella and Joshua made for him … they picked the colours, the DSP, the type of ribbon, the stamps … and then they punched and stamped and glued … and Bella coloured in … they loved it! We had such a wonderful afternoon together 🙂 I was very proud of them. Not only do I get to have fun with my kids making cards … but as a demonstrator, I also get to see the new catalogue early and all demonstrators also got a sneak-peek and pre-order opportunity this year! So, do you see any new colours on these cards?? 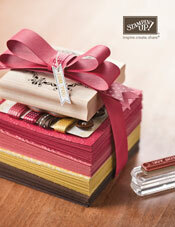 Because, each card has a sneak peek … for you … of two new In Colors … and a new stamp set too … called Cheers to You. I must say … I will really, really, really miss In the Stars when it finishes with the new Summer Mini on 31 March … it has been a fabulous stamp set for me! I used the colours Pretty in Pink, Pale Plum and Whisper White, plus I used versamark with Heat & Stick and Dazzling Diamonds. I really love the jumbo wheel, Nursery Letters, for baby cards … it looks fabulous embossed and all glitzed up in bling! And I love the butterflies from Live Your Dream (available in the Summer Mini which finishes at the end of this month) … I stamped the butterflies in Pale Plum and cut them out, sticking them on with dimensionals. Then I used Short & Sweet to finish off the sentiment and wrapped the card with white taffeta ribbon. Today is my son’s birthday … and he is 3! This is the card I made for him (not that he paid a single look at it!! ), but I really like the way it turned out. I based the colours around the retiring paper, Spring Break, and used the colours Not Quite Navy, Old Olive and Metallic Silver. The jumbo wheel, Classic Stars, has been embossed using silver powder. I’ve embossed the Best Friends Number “3” and cut it out (another stamp set on the retirement list). The “3” is mounted on a 1 1/4″ circle, stamped with the small star from In the Stars, and mounted on a punched out star. I’ve added silver eyelets in the corners and a strip of Old Olive wide grosgrain in the middle. Did you know that the Spring Break DSP is only $8.96 at the moment ??! … the cheapest it will be ever, especially for double-sided paper! After 1 April 2009, all DSP will be $19.90 … so get in before the price goes up! On Friday night, a few members of the Creative Stampers team got together and held a fantastic fundraiser for the NSW Cancer Council. Wow! It was an exciting night … I heard lots of comments like “I’ve never sat down and made 10 cards in one night!” and “Isn’t it nice to sit down and make a card that’s pre-cut” … and everyone there had a smile!! Below were the lucky door prizes … and you can see the main lucky door prize in front of the basket (it had a Simply Sent kit in it and other goodies). I was stoked that one of my customers (and friends! Hi Jenne!) won the main lucky door prize!! Below are a couple of photos with everyone hard at work. They had 10 cards to make and everyone had finished by 10pm … what an accomplishment! Well done to everyone who participated! I must say, it was special to work with the great ladies who make up the Creative Stampers … Jo Wassens being our fearless leader!! The night went off without a hiccup … a testament also to Merryl Blacker’s excellent organising! The above card used the retiring stamp set, Simple Somethings, and the retiring In Color Purely Pomegranate including the Purely Pomegranate Double-stitched ribbon. The flower card used the retiring stamp set, Snowflake Spot, as well as the retiring In Colors … Purely Pomegranate and River Rock. The above card used the retiring stamp set, Carte Postale, including the Leaves a la carte jumbo wheel … and the retiring In Color, Groovy Guava, Moss Gingham ribbon and Metallic eyelets. The above card uses the retiring stamp sets All Through the Year and It’s Your Birthday … and the retiring In Color Wild Wasabi. The above card used the retiring stamp set, Petal Prints, and the retiring In Colors, Blue Bayou and Soft Sky. This cute little card (above and below) used the retiring stamp sets Big Pieces and Little Pieces. A big thank you to everyone who participated on the night … we raised over $1,100 for the NSW Cancer Council. This week it has been fifteen years since I lost my best-ever Nan at the much-too-early age of 65 … to lung cancer (yes, a smoker). So this was a night very close to my heart! Thank you! !